Environmentalism The Footprint Chronicles What is a living wage vs. a minimum wage? Simply put, a living wage is a decent wage, one that covers the basic necessities for life: food, water, housing, health care, education, clothing, transportation and child care. But there is no universal living-wage calculator. While one organization may base a living wage upon a family of four with one working adult, another bases its calculations on a family of five with two working adults. For years, various governments, businesses and civil-society groups have been working to bring awareness to the problem of unfair wages, regulate working conditions and worker hours, raise minimum wages, empower workers and find viable strategies for getting workers across the world out of severe poverty. Article 23 of the United Nations Universal Declaration of Human Rights states, "Everyone who works has the right to just and favourable remuneration ensuring for himself and for his family an existence worthy of human dignity..."
But even the bare minimum for survival is not guaranteed among garment workers. Largely due to a desire for cheap labor, the garment industry is often one of the first to move into developing countries, where unempowered people and communities are ripe for exploitation. During the last few years, we’ve seen factory workers across the developing world pushed to increase production and work ever faster—sometimes with tragic results—to try to meet the insatiable appetite of buyers, mostly from developed countries. This creates abuse where the most vulnerable workers in the supply chain face an unbearable workload coupled with unfair, unsatisfactory wages. With the bar set so inhumanely low, reaching a living wage for garment factory workers has become an aspirational goal. Because reliable, consistently aligned living-wage estimates don’t exist for most of the countries in which Patagonia does business, we still don’t know exactly what wages to set as our goal. What we do know is that the majority of workers in our supply chain do not currently earn a living wage. Patagonia is taking steps to improve the lives of people who make our products. To address the challenges surrounding reliable living-wage benchmarks, we have begun working with Fair Trade USA and are embarking on a large, complex fair-wages program with the Fair Labor Association (FLA) as part of our membership. Since 2014, Fair Trade USA, a U.S.-based nonprofit, has helped us to work directly with our sewing factories to bring increased income to those who work in our name. Fair Trade USA has developed a unique way of empowering workers, charging companies such as Patagonia an additional cost for each item. The additional funds we pay go into a worker-controlled account, which factory workers can decide to use toward individual cash bonuses for all workers in the factory or to pay for a worker-chosen project that benefits all workers. In fall 2015, Patagonia worked with six different factories to produce 191 styles using Fair Trade Certified™ sewing, reflecting a significant increase from the 10 Fair Trade styles we had in our line just one year before. We’re proud of our progress. There have been unexpected benefits of bringing Fair Trade to our factories. 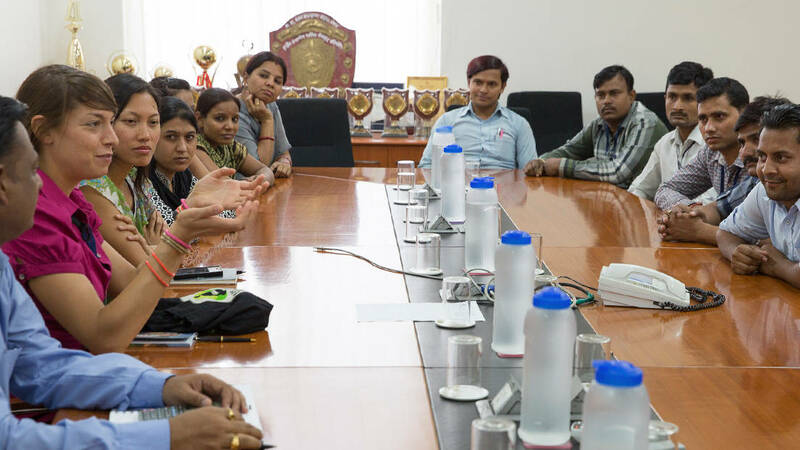 In 2014, workers at one of our Indian factories not only earned additional income in Fair Trade premiums, but also gained new lines of communication with the management team. When factory managers learned that employees had voted to use their Fair Trade money to build a clean and safe cooking facility at the factory, the managers decided to pay for the new kitchen themselves. As a result of dialogue sparked by Fair Trade, factory managers were able to better understand the needs of their employees: Workers got a safe space to cook, and they were able to use some of their Fair Trade funds to buy raincoats for the monsoon season. In addition to Fair Trade, we are also trying to address living-wage issues as a member of the Fair Labor Association. Currently, the FLA is collecting wage data worldwide and will publish charts that plot poverty lines, minimum wages and living wages against factory compensation. We will use these charts to gauge the gap between what we pay and what is considered a living wage. By December 2017 we will have established our wage benchmarks with FLA and will have plans in place to begin raising wages in our finished-goods supply chain. We are frustrated that we cannot currently quantify a living wage in the factories in which we make our products. And even then, a living wage is just the bare minimum required for people and families to survive, not thrive. We are hopeful the FLA program and wage benchmarks can solve this problem, which has left the industry paralyzed. The wage benchmarks will also be helpful so member brands have a target and can publically report their progress. Every day we wrestle with determining what customers are willing to pay for their clothes. We need our retail prices to remain market relevant in order to stay in business, thus we can’t universally raise wages in all the factories we work in. At the same time, we want to be a fair and good partner in our business relationships, and that means looking more deeply at wages. Fair Trade is a first step, but only a first step. We firmly believe that by being in business we can influence change and show what can be done to ensure wage equity throughout the value chain. We don’t have it all figured out. It will be a tough, bumpy road and there are a lot of unknowns, but we are excited to take the next big step forward.